E.R. Advanced Ceramics develops and manufactures a great variety of technical ceramics built to withstand extremely harsh environments with outstanding performance. Below is only a sample of the services we can provide to meet YOUR needs. 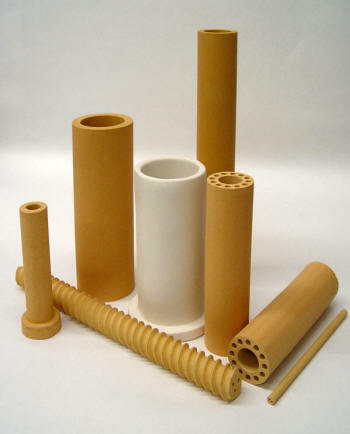 We specialize in the manufacturing of industrial ceramic products with unique designs and complicated shapes by pressing, extruding or casting. Our experienced staff will work with you from your drawings to prepare a quote to meet your specific design requirements. We have over 80 years experience in custom engineering, materials expertise, operational excellence, and execution. We help our customers develop amazing solutions to their toughest technical challenges. Our experienced engineering and manufacturing experts will work from your drawings to prepare a quote to meet your specific project needs. 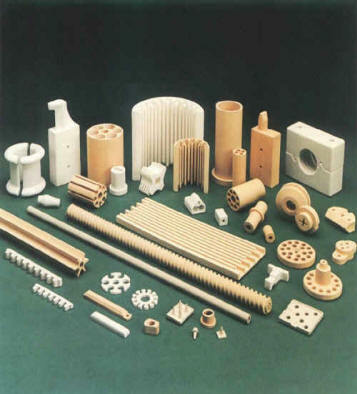 Alumina: Alumina or aluminium oxide is an amphoteric oxide of aluminium with the chemical formula Al₂O₃. It is also commonly referred to as alumina or aloxite in the mining, ceramic and materials science communities. Cordierite: Cordierite is mainly a structural ceramic, often used for kiln furniture due to its extremely good thermal shock. Mullite: Mullite is an excellent structural material due to its high temperature stability, strength and creep resistance. Porcelain: Porcelain is a ceramic material made by heating selected and refined materials often including clay in the form of kaolinite to high temperatures. Click here to view our complete list of materials. Our products have been field proven for performance and trusted by many of the largest companies in the industry. We specialize in custom made small run parts. Give us the opportunity to help you with your custom ceramic needs.